Don was born in the wild in Cameroon, Africa, around 1968. He and a female, Donna, were two of the last Western Lowland Gorillas removed from the wild. Don and Donna came to the Como Zoo in St. Paul in 1969 and quickly became very popular attractions. Donna was sent to the North Carolina Zoo for breeding in 1991. Over the years Don grew to become the silver-backed patriarch of an all-male group of gorillas at Como. Unfortunately, Don grew ill and eventually died of kidney failure on January 10, 1994. After his death, the Como Zoo decided to donate him to the Science Museum of Minnesota to be displayed as a taxidermy mount for educational purposes. A very generous private donor provided the funds to purchase a high-quality freezer in which to store Don until a taxidermist was chosen. 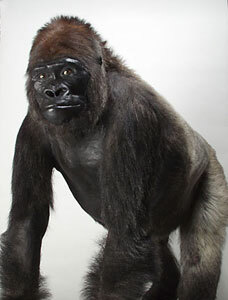 Because of their delicate skin and unique, expressive features, gorillas are a challenge to taxidermists. As a result, there are very few who work with gorillas. The museum finally decided on Tim Bovard, a taxidermist who works at the Los Angeles County Museum of Natural History. The same donor funded the taxidermy mount preparation as well as delivery of the 350-pound frozen gorilla to Los Angeles. He arrived safely after a long flight in a single-engine Cessna airplane, wrapped in a blanket of absorbent adult diapers. Don underwent an incredible transformation at the hands of Tim Bovard. The skin was tanned; a form was cast from Don's body out of dense urethane foam; and the face, chest, and paws were cast from epoxy and painted. The tanned skin was glued to the foam form. The work, however, was far from over. The skin was in poor condition owing to bloating from IV fluid present in Don at the time of his death and hair was lost in numerous spots during the tanning. The hairs had to be re-implanted into the taxidermy form, one to four hairs at a time. Tim implanted an estimated 6,000 hairs in Don's back, chest, and head. The work is finally completed and Don is back in St. Paul. Look for him to be displayed in the museum in the future. His skeleton is currently being cleaned by the museum's resident dermestid beetle colony, on view behind the Triceratops on the 3rd floor. Stop by and check it out!